Use a vegetable grater to grate the carrot and place them in a large deep bowl. Strain the 4 slices of pineapple and slice them into tiny pieces. 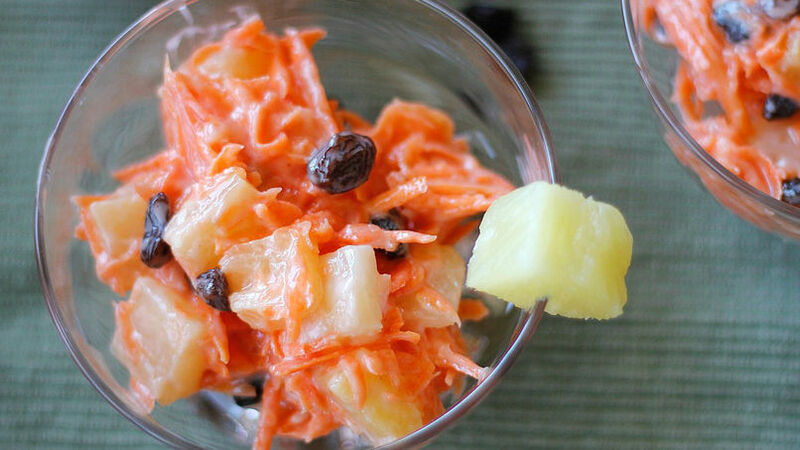 Add the pineapple, raisins and yogurt to the carrots and stir until everything is well combined. Serve immediately or if you want to serve it cold, place in a container with a lid and refrigerate until you're ready to serve. You can use vanilla yogurt instead of pina colada-flavored yogurt. If you don't have raisins you can use cranberries or nuts. I always dreamed of my Quinceanera party and remember when my parents mentioned to my family that we may not be able to afford the celebration because of the financial situation we were going through at the time. Everyone thought that something had to be done, so they all volunteered to help out. Some cooked, others made the centerpieces or handled the music; in the end, it became a family project. My party was fantastic. My whole family got together, there was a lot of dancing and fun, and as always, the food was delicious. Among the many family recipes in the repertoire we have tons of salads and the recipe below is very similar to the one we ate at my party. In this case I only changed the dressing. I hope you like it.